Visit the Coyote Plot Gallery for graphics code and links to additional graphical information. How do I create a graphic with a specified aspect ratio? How can I add a second, logarithmic axis to my plot? How can I create a plot with irregular tick spacing and values? How can I create a polar plot with axes through the center? I'm trying to do yada yada with log axes and it's not working. What am I doing wrong? 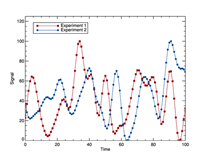 I found the error bar routines in IDL, but can I plot error bars in the X direction, too? Is it possible to get the X axis labels on top of the plot instead of at the bottom? How do I fill the area under a curve with a color? Is there any way to change the text orientation of axis labels? Is there a way to plot the wave length on one axis and the corresponding wave number on another? I'd like to make a sort of stacked ladder plot. Can this be done in IDL? There is no room for a title on my plot. What can I do? I want to plot pressure on the Y axis, but I want the data range reversed. How do I do that? Is there a way to label minor tick marks on a logarithmic axis? Can you show me how to display a colored background inside my plot axes? How come my minor tick marks disappeared? Why does my sine plot look so lousy in IDL? Is there a way to draw a transparent polygon over my line plot? How can I include a grid on my line plot in IDL? 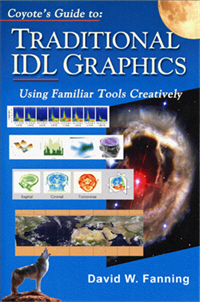 How can I draw a multi-colored line in an IDL graphics plot? Can you show me how to draw a box and whisker plot in IDL? Instead of using symbols, can I use numbers to label my plot? Yikes! Changing the X range of my plot affects the Y range. Is this a bug? Can you show me how to create an anisotropy pie plot in IDL? Do you have any tools for zooming into and out of line plots? There is a hole in my filled contour plot, especially noticable when I make a PostScript file. Why? My filled contour plot colors look great on the display. But three contours are gray in my PostScript output. Why? What is the relationship between filled contour values and colors in the color bar? 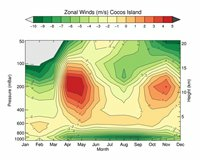 How can I make missing data look, well, missing in filled contour plots? Can you show me how to create a Dot Plot in IDL? Can you show me how to create a Polar Plot in IDL? Can you show me how to create a plot within another plot in IDL? Can you show me how to create a Transparent Polygon Plot in IDL? 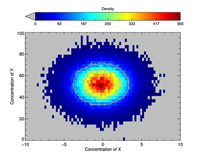 Can you show me how to create a Density Plot with contours in IDL? Can you show me how to create a StreamFunction Plot in IDL? Can you show me how to create a Box and Whisker Plot in IDL? Can you show me how to create a Google Map Plot in IDL? Can you show me how to create a OpenStreet Map Plot in IDL? Can you show me how to create a Lidar Range Plot in IDL? Can you show me how to create a Lidar Track Plot in IDL? Can you show me how to create a Google Earth Plot in IDL? Can you show me how to create a AVI Movie Plot in IDL? Can you show me how to create a MPG-4 Movie Plot in IDL? Can you show me how to create a Wind Rose diagram in IDL? Can you show me how to create a Sun Symbol in IDL? How do I overplot data on a !P.MULTI plot? How do I position plots on the display? How do I position images on the display? How do I turn axis labelling off? Why don't graphics windows resize smoothly on my Windows machine? How do I leave room for a title when plotting multiple plots? 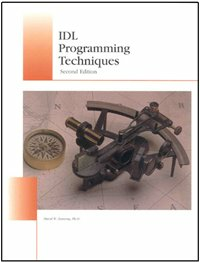 How can I create a circle in IDL? How do I draw a rubberband box in a regular graphics window? How can I print the contents of the current graphics window? How can I tell if a graphics window is still open and available. Can I force IDL to use exponential axis annotation? I finally got my cheapskate boss to update IDL, only to find my favorite RDPIX program doesn't work. Help! What is the best way to make a scientific animation in IDL? Help! I just want to center my plot on the page with the PRINTER device. Is this possible!? I'd like to cut and paste a graphics window from IDL to Powerpoint. Can this be done? How do I get nice looking fonts in the Z-Buffer? Can I make a JPEG file of a line plot without opening a graphics window? What do people use to overplot vectors on their graphics plots? How can I create a color (JPEG, TIFF, PNG, BMP) image from an IDL graphics window? Have you noticed odd cursor behavior with Mac OS X? Is there a routine in IDL for clipping polygons? How can I display an image with a log-linear aspect ratio in IDL? Can you show me how to obtain the location and value of a displayed image? What is the best way to produce IDL graphics output for Web or Powerpoint display? How can I interactively annotate a plot window in IDL? Can you show me how to display a function of two variables as an image? Why is the first graphics window in my IDL session always blank? 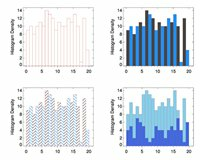 What is the best way to create multiple plots in IDL? Do you have a Coyote program for drawing velocity vectors on a map or plot? How do I create 3D axes? How do I add 3D axes to a rendered isosurface? How do I display a particle trajectory in 3D space? How do I create a 3D scatter plot? How can I exaggerate the Z axis of a surface plot? How can I grid 3D spherical data to view with SLICER? How can I draw a surface plot with axes through the origin? How can I shade my surface plot according to its elevation? How can I create a semi-transparent surface in IDL? Why can't I use the [XY]Range keywords to display just a portion of a surface? How can I display my XYZ data as a surface? Can you show me how to create a 3D representation of a surface from image ROIs? Is there a device independent, color model independent replacement for the TV and TVSCL commands? How can I plot an image profile along any arbitrary line in an image? How do I interactively adjust the contrast/brightness of an image using direct graphics? How do I interactively adjust the contrast/brightness of an image using object graphics? How can I convert an RGB image to a gray-scale image? Can you show me how to draw a boundary around a region of interest? I'd like to create an ROI mask for my image. How do I do it? How do I fit an ellipse to a region of interest? "Pixel-interleaved. Band-sequential..." Just tell me this: Where does the 3 go? How you show me the IDL Way to turn an 8-bit color image into a 24-bit image? How can I add a blend two images together so it appears one image colors the other? Is there an easy way to display a maximum intensity projection of an image? How can I display a transparent image in IDL? How can I interactively annotate an image in IDL? How can I interactively query an image in IDL? How do you set up a map coordinate space so you can draw map boundaries and grids on an image? How can I brighten up my dark, dull MODIS reflectance images? How can I partition image values into distinct colors for display? How do I create a transparent image in IDL? Does Congrid resize images correctly? How can I create multiple transparent images in a PostScript file? How can I add Poisson noise to an image in IDL?